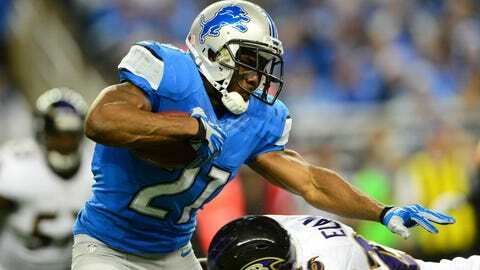 Reggie Bush needs 60 rushing yards to end a ridiculous trend for the Lions. Four weeks ago, the Detroit Lions came off a tough road loss in Pittsburgh and needed to bounce back at home against the inferior Tampa Bay Buccaneers. The Lions opened as 9 1/2-point favorites, but they lost the game, one that ultimately could cost them the division title. Schwartz's job appears to be on the line in these final two weeks of the season, and his players know it. Now they’re coming off all the Monday Night Football hype and the disappointment over losing on a 61-yard field goal to the Baltimore Ravens. They again opened as 9 1/2-point favorites for Sunday’s game against the New York Giants at Ford Field. 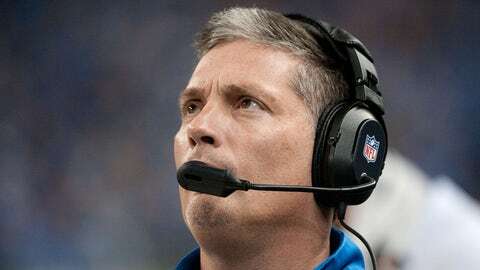 Just ask coach Jim Schwartz and middle linebacker Stephen Tulloch. Schwartz was the defensive coordinator and Tulloch a rookie for the Tennessee Titans in 2006. The Titans went into the final week needing Denver, a 10 1/2-point favorite, to lose to San Francisco; Cincinnati, a 6-point favorite, to lose to Pittsburgh; and Jacksonville, a 2 1/2-point underdog, to lose to Kansas City. All three of those things happened to give Tennessee a chance. But the Titans came away with an empty feeling because they didn’t take care of their end of it, losing at home to New England. "Coach (Jeff) Fisher had told the team, ‘These things need to happen and they’re going to happen,’ and they did. 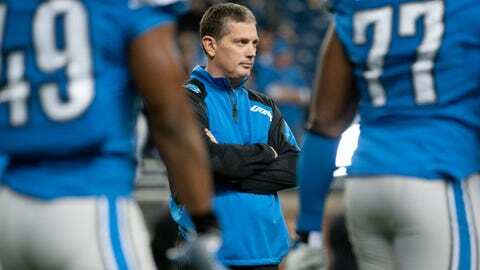 The Lions’ playoff formula isn’t nearly as complicated or difficult. They need Chicago (at Philadelphia, vs. Green Bay) and Green Bay (vs. Pittsburgh, at Chicago) each to lose one of their final two games. Chicago is a three-point underdog against Philadelphia. Say the Bears lose to the Eagles but then beat the Packers, the door will be reopened for the Lions. One thing is certain: Detroit must win both of its games, against the Giants and then at Minnesota, to have any chance. There would be no worse feeling for the Lions than to watch Chicago and Green Bay both lose, but then not win the division because they lost, too. "I wish we would have handled it a little better, but we still have a chance to get in," Tulloch said. "We just have to handle our business." It has been nine years since a Detroit player recorded a 1,000-yard rushing season. Kevin Jones ran for 1,133 yards in 2004. "Hopefully, I can break that," Bush said. "That would be nice to add to the resume. It’s tough to run the ball in this league and to be able to gain 1,000 yards." It will be Bush’s second 1,000-yard season in his eight-year career. He rushed for 1,086 two years ago with Miami before falling short last season at 986. Since Jones did it for Detroit, there have been a total of 143 1,000-yard rushing seasons in the NFL, including nine so far this year. Barring an injury, the Lions should have one, too. They’ve lost nine straight games in December/January. That includes the regular-season finale at Green Bay in 2011, a playoff game a week later at New Orleans, all five last year (vs. Indianapolis, at Green Bay, at Arizona, vs. Atlanta and vs. Chicago) and the first two this month (at Philadelphia, vs. Baltimore). The last time they won this late in the season was the playoff-berth clincher two years ago at home against San Diego on Christmas Eve. That seems like a long, long time ago. The Giants lead the NFL with 39 giveaways, but the Lions are making a late-season push to try to catch them. Detroit has committed 18 turnovers (10 interceptions, eight fumbles) while losing four of its last five games. The Lions now have the second-most giveaways with 31. It’s probably too late to catch the Giants, but with the way things are going, who knows? Here’s a prediction: The last team not to drop the ball in this game wins. The Giants, who have lost two straight following a 5-1 stretch, have nothing to play for in terms of the playoffs. They’re 5-9 and already eliminated. Will they play for pride after their coach’s comments? Or are they going to tank the last two games, too? "It’s different and it is tough," quarterback Eli Manning said of having no playoff hopes at this point. "We will see what this group of guys are made of." Pettigrew is best known for his dropped passes over the years, but his blocking is an important element of the offense. The Giants, meanwhile, will be without receiver Victor Cruz (knee/concussion), who leads the team with 73 receptions for 998 yards.